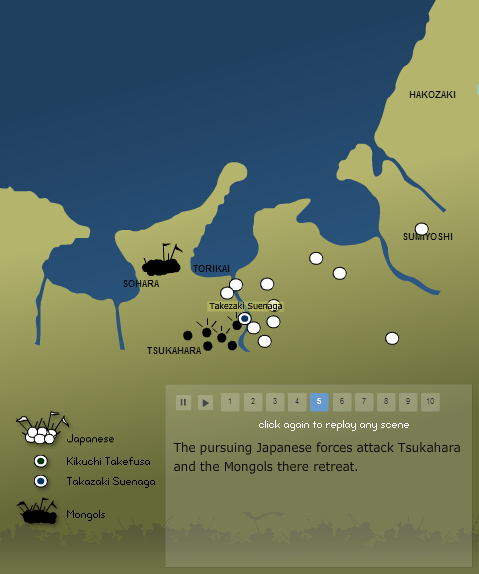 Resource: Interactive Resources on the Mongol Invasions | What can I do with a B.A. in Japanese Studies? Looking back at 2014, there was big news in October that underwater remains of a shipwreck likely to be part of the 13th century Mongol fleet that attacked Japan were found near Nagasaki. Similar finds stirred historians and archaeologists alike back in 2011. But even if you’re not a marine archaeologist, thanks to Bowdoin College there are some great interactive tools you can use to check out primary resources related to the invasions as well as interactive maps track the progression of the historical figures involved. The Scrolls of the Mongol Invasions of Japan website is an ongoing project led by Thomas Conlan, Associate Professor of History and Asian Studies at Bowdoin, and author of the book In Little Need of Divine Intervention: Takezaki Suenaga’s Scrolls of the Mongol Invasions of Japan. The site is divided into two major parts. One is an exploration of the illustrated Mongol scrolls commissioned by Takezaki Suenaga, a warrior who participated in both the 1274 and 1281 campaigns. Here the site is divided into three sections, the first of which is for viewing the scrolls, where you have a choice between four different versions of the Mongol scrolls from different centuries. High resolution imaging allows you to pan through the scrolls and zoom in at great detail. 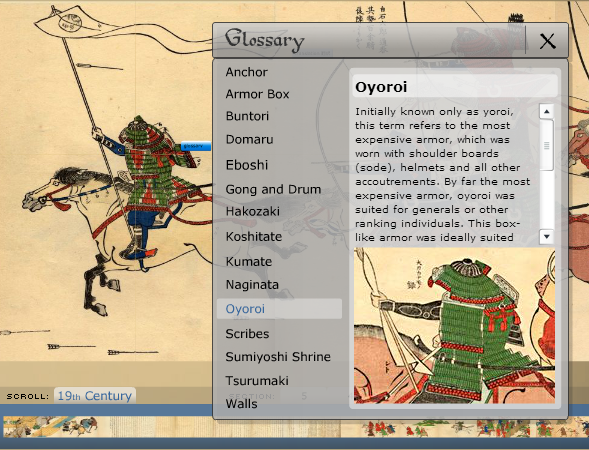 There are also areas that you can click to access a pop-up glossary that explains certain images in the scroll, be it a historical figure or a representation of objects held by the persons depicted. Since the site includes these four versions of the scrolls from different times, the Compare Scrolls viewing option is especially interesting, as you can line each scroll up on top of one another to see how the progression of the story and the images, etc. have changed over time. Since scrolls such as these were at times cut up and the images or text rearranged, this is a particularly valuable tool. And if you want to go even more in-depth into the technical aspects of scroll production or the stories behind particular scenes, the Guided View option provides even more information by Conlan, who is the leading expert on these scrolls. The second main section of the site provides interactive maps of the invasions. Here you can see the movements of both Japanese and Mongol forces over the course of the campaigns in 1274 and 1281, including destruction wrought by the Mongols and the construction of defensive stone barriers by the Japanese. Broken down into ten sections per map, the progression is briefly described as it plays out. You can click through to your desired point in the battles or press the play button to watch it visually play out. 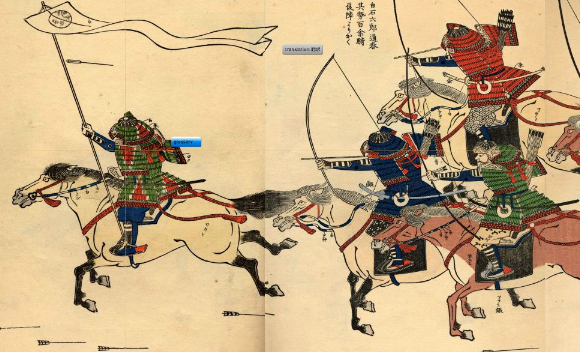 The Scrolls of the Mongol Invasions of Japan website is a great resource for gaining both a basic and in-depth understanding of these influential historical events, with easy navigation and an excellent deployment of digital resources for exploring visual historical materials. If you’ve got a passing or serious interest in the subject, be sure to check it out or recommend it to others! This entry was posted in culture, graduate school, main posts, study tools, undergraduate, useful links and tagged emakimono, Japan, medieval history, medieval Japan, military history, Mongol invasions, Mongols, resources. Bookmark the permalink. Pingback: Resource: Interactive Heiji Scroll Viewer | What can I do with a B.A. in Japanese Studies? Pingback: Call for Writers: Articles, Resource Review, Fun Links | What can I do with a B.A. in Japanese Studies?